Peace! Victory! My eyes have seen the glory of the coming of the Lord! After four bloody years, the War of the Rebellion was over. 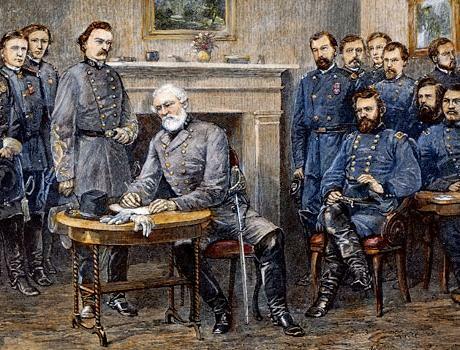 General Robert E. Lee had surrendered his army in Virginia. There were still some rebel forces fighting in other places. But now that Lee had given up, the rest of the South would surely accept defeat. Chicago had been on edge for days, waiting for Lee to capitulate. Then, early on Sunday evening, the joyous tidings flashed over the telegraph. And the city celebrated. People took to the streets, shouting and firing guns into the air. An impromptu parade started marching down Lake Street. As night fell, bonfires were lit. Straw-filled dummies labeled with the names of rebel leaders were tossed into the fires. Other dummies were hung from trees, where they served as handy targets for revelers flinging horse dung. At midnight the hundred guns of the Dearborn Light Artillery boomed. The noise continued through the night and into the dawn. Whether any of the city’s 200,000 residents got much sleep was doubtful. Monday came. Nobody felt like going to work, and most businesses remained closed. 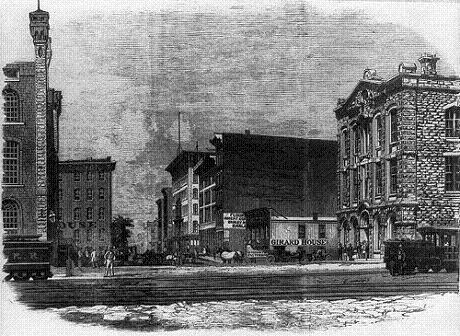 The Court House, the newspaper offices, and other important buildings were decorated with bunting. Street vendors selling tiny American flags on sticks couldn’t keep up with the demand. Another night of celebration followed. As the sun rose on Tuesday, Chicago finally started getting back to normal. 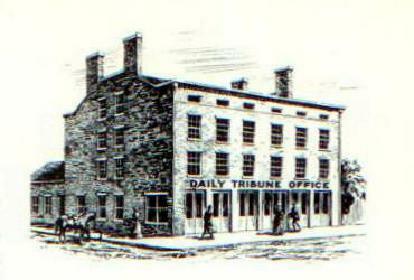 Though the war had not always been popular in the North, the Tribune had supported it whole-heartedly. Publisher Joseph Medill was a leader in the Republican Party and a close friend of President Abraham Lincoln. Now the Tribune reminded readers that many Democrats had defended the evil of slavery. Those Democrats had urged the North to make peace with the rebels. And as long as the North had fought the war in a “Democrat” way, the South could not be conquered. But then the government had decided to fight in a “Republican” way—total war. “There was no more foolery or conciliation,” the paper declared. “The war was made on the principles of coercion and subjugation.” Victory had followed. The period of postwar euphoria was brief. Before the week was over, President Lincoln was killed by an assassin.